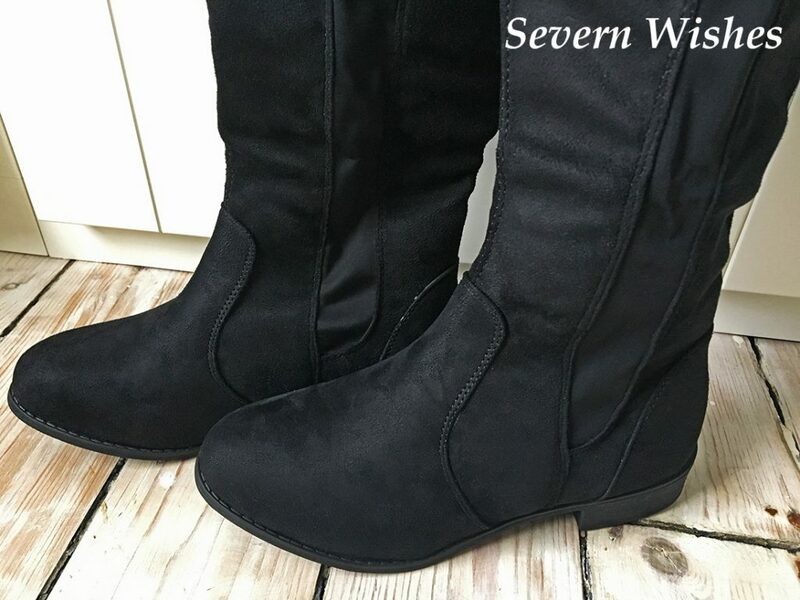 Today I am reviewing some lovely boots that I got in the January Sale over at BooHoo.com. I was lucky enough to buy on a day they gave 20% off, so it made these usually £35.00 boots just £28.00. For the material and good quality of it at first inspection, I was satisfied with the price that I paid. I usually go for a low heel or generally flat boots, I always prefer to walk than take a bus for example, and I just can’t do that in Boots that have 4″ heels! Ha! Ha! I was a little disappointed there was very little grip on the base of the shoes, you would assume a Winter boot would have something to allow you to be more stable on your feet. That said I have bought these boots to wear indoors, shopping and meeting friends etc. I don’t plan to walk any long distances outside in them. Those of you who know me and know how I blog, know that I don’t just wear something for an hour and then review it. I like to test the products fully and give my honest opinions. I would usually wear and wash with all new clothing I test, where as with shoes I like to wear them for a good distance, check the wear and tear of the sole both inside and out. I will now outline some details about the Boots themselves, before giving more information on the scores I have given them and why. My first thoughts when I put the Boots on were how comfortable they were. The soft suede like material on the outside is replicated on the inside with another smooth material which feels like a polyester or similar, that allows them to glide on and off your legs with ease, but they also didn’t fall down while walking which is another bonus. You can wear these boots with a versatile array of wardrobe favourites. Skinny Jeans, Skirts, Short Dresses and even Leggings and a Tunic would work well too. Because the style is Black they go with a majority of Fashion. I love to wear long boots and long tops, dress this style up with a scarf and some jewellery on your arms. You can even dress them up for a night out by wearing a sparkly top, dress or jumper. A nicely patterned, sown together pieces that have various panels of the fabric that can be seen. 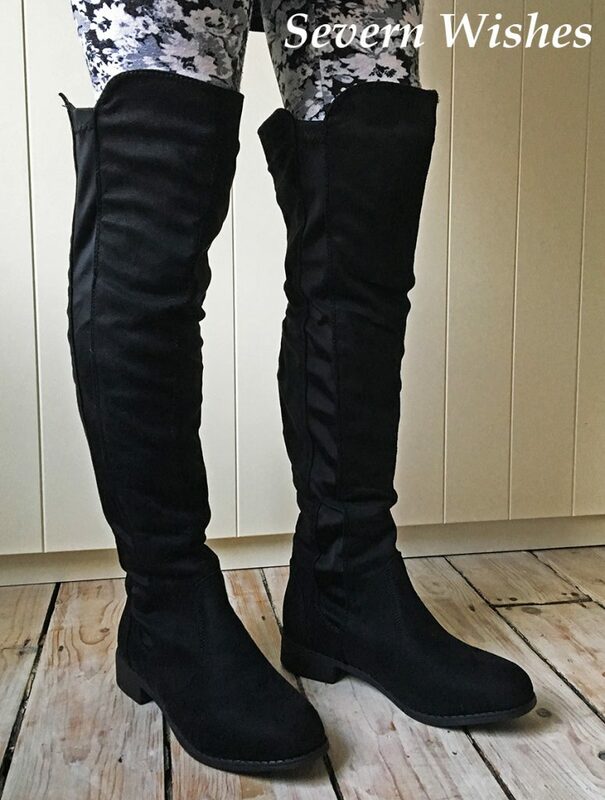 I also love how the fabric is cut at the top of the boots, there is a length shorter that sits along the back of your knee, it means the boot is comfortable whether you’re sitting or standing. The shapes of the sown parts are flattering to the leg too. When I first got them out the box and photographed them they almost seem ruched because of where they had been folded, but the creases soon fell out while I wore them. I had them delivered next day and it was less than twenty four hours, I am nearly always impressed with the BooHoo delivery service. These boots were delivered in their own box and also each boot was inside a slip. Suede boots should be stored in thin cotton bags or a similar material so the fabric is able to breathe. Then stored somewhere at room temperature and no where near damp. The box however is very handy for things like Summer Shoes that can be stored away for the next couple of months now. I’m impressed with how the Boots felt when walking, they were rather comfortable. This is down to soft material through the entire boot and I only wore one pair of socks with these boots, and found that they fitted my feet true to size. The sole of the boot is designed with a smooth curve at the front which didn’t squash my toes. The cut design at the top of the boot allows them to be well fitting when sitting or standing. The overall quality of the Boots I have scored at a 4. When I choose new shoes or boots I’m looking for several things to tick in my boxes. These boots get points for the feel when wearing, the softness of material used, the unusual stitched pattern and they also fit true to size. However it did loose an overall one point for quality. The point loss comes from the lack of grips on what is meant to be a Winter Boot, I wouldn’t feel safe wearing these on an icy morning to work. 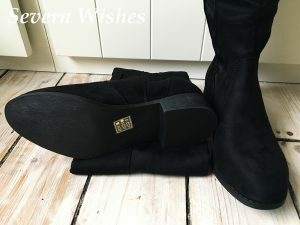 I purchased these Boots for £35.00 (discounted to £28.00 on an offer) and believe they are good value for money, if only they had a better sole attached then it would be a full house. I am hoping the Quality and Value will remain for the time that I continue to wear them, I know that only time will tell. Pro: Soft Material and ideal for keeping warm in Winter due to their long length up to the knee. Comfortable to wear due to the soft material inside and outside of the boots. Con: You need to spray them before wearing them outdoors and don’t ever wear them outside in very wet weather. Most shoe shops sell the water and suede protecting spray for a few pounds. Another con is the lack of grips on the sole of the shoes. I hope you have enjoyed reading this review and you have enjoyed reading about these particular style of Boots. 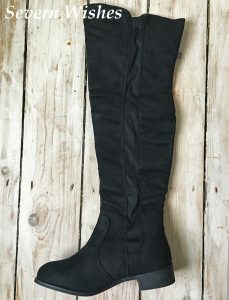 If you aren’t sure about this style here are a few other £35.00 Black Boots that BooHoo currently have in stock. Just click the link on this image to go over to their Boot section of their website. 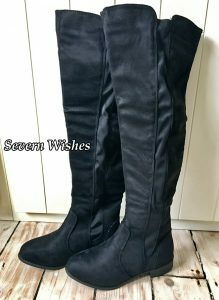 They do Calf High Boots if the Knee High aren’t your thing! Thanks for reading! See you next review! This entry was posted in BooHoo, Fashion, Footwear, Reviews by Sabrina. Bookmark the permalink.